the Mackintosh Centre (former Queen’s Cross Church). I'm not sure whether to put this into the Hous'hill Thread, but I have just resized a bumch of pictures from a trip to House for an Art Lover in Bellahouston Park. Went with my mum, a really nice afternoon out (the cafe downstairs is very nice, but pricey). I'm thinking of doing a bit of a Mackintosh tour, so I'll post more pictures when I go. Staggering stuff. "Art is the flower" indeed. Great photos Ally Doll. Do you have any more of the interior? No, sorry! The classrooms aren't actually that exciting, Mackintosh and the School Board had some disagreements regarding how much freedom he had with the design - they didn't really know what they were getting into by hiring him was my impression - so it's not as full of his flourishes as the Hill House, the Tearooms or the School of Art (all of which I intend to visit soon!). There are some interesting models of the area inside, pre and post motorway building. The school had to close as so much of it's catchment area had been cleared. I know there are lots of books on Macintosh but their photos don't really provide the atmosphere that can be produced like some of the pictures posted on here. Look forward to seeing more when you do your tour. This was in the sculpture garden in the Huntarian - the sign said that it was originally a 'finial' on the Pettigrew & Stephens building at 181-193 Sauchiehall Street - I'm guessing this is where the Sauchiehall Centre is now? 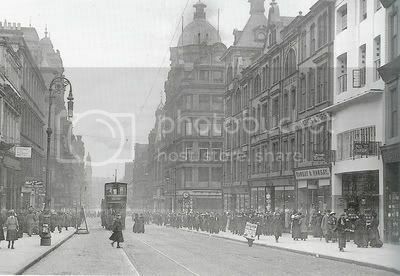 Does anyone have any pictures of the building with it in situ? Wow, that second picture makes the Willow Tea Rooms look even more striking! Meant to say, great pic! Thanks for sharing it You can really see the Japanese influence on Mackintosh at work here, it's almost a perfect little pagoda but with a delicate classical touch in the stylised columns which appear to be a hybrid ionic/corinthian concoction. Sort of East meets West condensed into a finial. 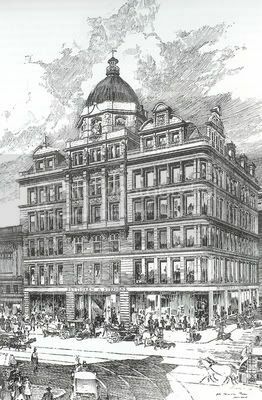 Where does tat take us then... India I suppose, it looks as though it could have been lopped off a Moghul palace and not a 19th C Glaswegian department store. Funny auld world. Anyone remember seeing it at the Garden Festival? Can anyone spot it in the aerial pics? Excuse me being stupid, but is that door meant to be there, hell of a doorstep.